Even when your caravan is tucked away in storage, it is still exposed to a whole host of risks that could potentially cause you problems when it’s time to start enjoying the next caravanning season. A common difficulty facing caravanners is making sure their caravan is kept clean, dry and secure whilst it’s in storage. There are a number of ways to achieve this; first of all, it’s important to keep the caravan well maintained. Clean it thoroughly before storing, drain down and ensure it is watertight. For extra security you could also invest in devices such as an alarm, axle wheel lock, approved tracking device or a caravan cover. As you already know, the benefits of fitting safety and security devices to caravans are endless. Not only do they offer peace of mind when touring, they help to reduce the threat of theft when the caravan is in storage. What’s more, for Caravan Guard customers, alarms, wheel locks and trackers can collectively reduce insurance premiums. One thing these devices cannot do though is keep bad weather at bay, which is perhaps why caravan covers have become phenomenally popular in recent years. 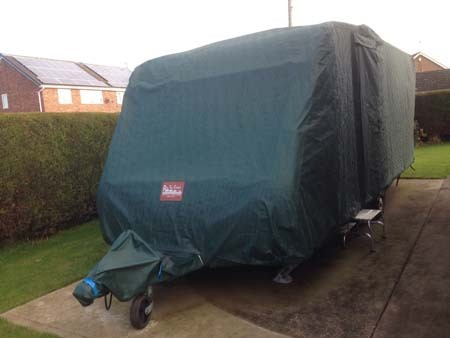 Investing in a cover for your caravan is one of the easiest ways to keep it in tip top condition when in storage. They can also help to shield caravans from the effects of strong winds, heavy rain and light hail. 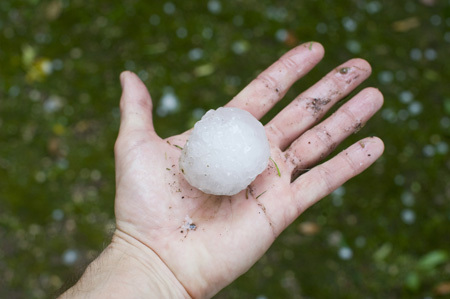 As we saw back June 2012, when a 24-hour hailstorm created an insurance claims bill of over £500,000 for Caravan Guard, hail poses a significant threat to caravan roofs, windscreens and side panels. Even though there’s no definite way to avoid hail entirely, caravan covers can help to protect the caravan’s paint work which could potentially reduce subsequent claims and save you money in the long-run. We’ve seen similar weather conditions already this year, both in September and in late October when St Jude’s Storm tore through many parts of the UK. Caravan covers are a great way of ensuring your pride and joy isn’t badly affected if the weather takes a turn for the worse. Covers come in all shapes and sizes; Pro-Tec Covers for example, are designed to protect from debris, strong winds, light hail and water ingress. Covers are generally waterproof, UV stabilised, non-abrasive, breathable so that moisture can escape and offer Velcro door access plus allowances for aerials and flues. These covers are specially designed to keep caravans clean and dry by preventing black streaks, condensation, mould and dirt developing. Damage caused by tree foliage, branches and bird droppings is eliminated too. It’s certainly worth removing any foodstuffs to avoid attracting vermin into your caravan over winter. Finally, make sure the area around the caravan is clear; check for overhanging branches, aerials etc – things that could potentially bang into the caravan in strong winds – check our guide for protecting your caravan in high winds here. Put the gas heating on for an hour or so? Surely burning gas creates moisture in the air which will make the situation worse. And, putting table salt on concrete paths and driveways will cause the cement to break down and the concrete collapse? I’m no expert so perhaps someone can explain it better..
Ps. Too many take-aways are not good for you either! We have used a caravan cover this year for the 1st time and I have to say it will be the last. Yes it has kept the caravan clean on the outside but the inside is another matter. 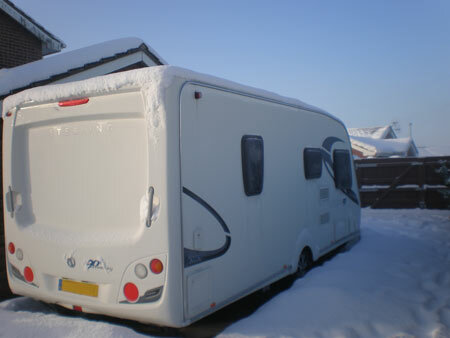 We keep the caravan in storage so only call in a few times over the winter months. We called a Christmas and all was fine, but two weeks ago we were shocked to find mould growing in the bathroom on the walls, the shower cubicle and in the cupboards. Luckily it cleaned off quick easily but had we left it any longer I really don’t know what state it would have been in and we did have dehumidifiers in the caravan. On checking the internet we found that this seems to be quite a common problem with one person having such bad mould in the caravan it was now un-useable as they can’t clean it off. We think with all the rain this winter the cover has remained wet and stopped the caravan from getting any ventilation. So we won’t use it again, I would rather have to clean the outside than risking the inside being destroyed by mould. We had the same problem when using a caravan cover. Mould on the doors which we could wipe off. But the mould around the window ledge at the front has permantly stained. Not using this cover again even though it suppose to be breathable. Thanks for your comments Lesley. May be speak to the manufacturer to see what advice they can offer. When I put my caravan away for the winter because I cannot store at home but on a stowage site I put inside the van about 5-6 Chinese take away trays of cheap cooking salt, I also leave the gas bottle connected so when I go & check on the van every month or so I stay for a hour & switch the gas heating on then at the same time I change the salt, I keep the old salt & use it on the pavements & paths at home so no wastage. I have just got back from winterizing my caravan at a secure location. Most important thing for me this time was the tyres. Had to pay £80 for a new one this month, as the two year old tyre had rotted at the bottom because it had been stood over winter in one spot. Have been advised to either use second hand wheel/tyres for over winter standing (impossible to find now.) or use axel stands to lift the wheels off the ground. Hopefully the latter will work. Please pass on the importance of this as I towed 1000 miles from the South of France without noticing the appalling condition of just one part of the tyre. Hi Carl, we suggested this as a precautionary measure. Like you say, the most important thing is to ensure cylinders as kept as cool and ventilated as possible, wherever you chose to store them. Thanks for your tips David, I’m sure others will find them very useful. It’s always worth keeping the caravan’s external surfaces clean. Such a shame about the discount! It will be available right through to December so if you have any further problems with the replacement, perhaps try Pro-Tec. I am now on my fourth cover which is so very important protecting my van. Wash/Wax/cut foam pipe central heating insulating (B and Q ) place on skirt as extra protection where buckles touch the skirt( stops abrasion ) Collect van in April and no need for a wash as the van is perfectly clean and no dampness. Did not know about 10% so lost out with by ordering another brand which regrettably does not fit although tailor made for Elddis Affinity 540! Now waiting replacement and all of the trouble to remove and replace . Your advise about removing gas bottles seems to be a bit over the top. What place could possibly be cooler and more ventilated than the caravan’s gas locker. I have never removed gas bottles and have never experienced any trouble with them. By all means disconnect the gas regulator hoses and make sure that the bottle valves are tight but physically removing the bottles is, in my opinion, unnecessary. Propane is usually the preferred gas and will stand much lower temperatures. Propane has a lower boiling point than butane so it will continue to convert from a liquid to a gas even in very cold conditions, down to -45ºC. When stored as a liquid in a tank, it exerts a greater pressure than Butane at the same temperature. So Propane, as an LPG, is most suitable for exterior storage and use.